This year the annual Bridges Math Art conference was held in Stockholm Sweden. Along with a busy program of lectures and workshops, the art exhibit is always a highlight of the event. There was so much interesting work on display that is hard to select just a few to write about in the blog. I encourage everyone to take a look at the on line gallery available on the Bridges website. 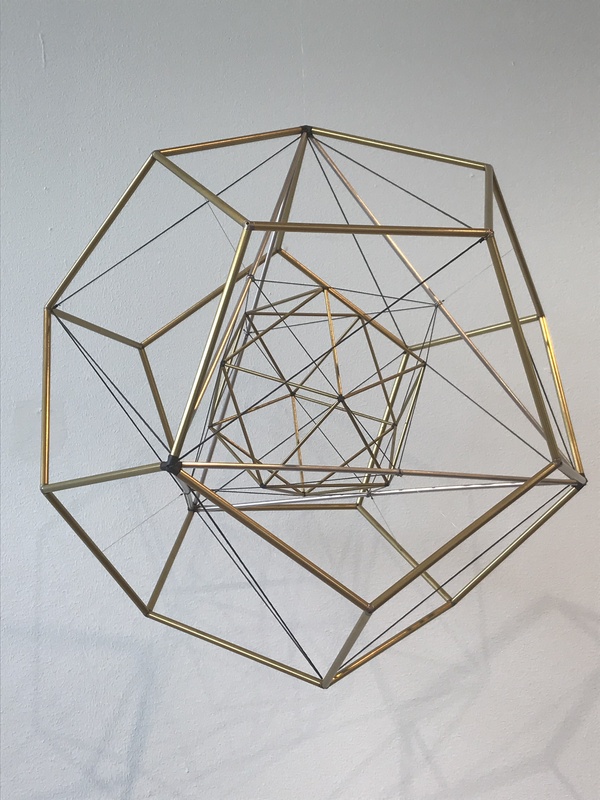 Martin Levin’s brass and aluminum sculture “Altogether II” was particularly fascinating to me because it includes all five of the platonic solids. By using thin rods as lines in 3-D space, Levin outlined the figures so you can see the shapes stacked inside each other. Platonic solids are comprised of faces that are regular polygons and at each vertex there are an equal number of faces meeting. The five Platonic are: Tetrahedrons with 3 equilateral triangular faces at each vertex, Cubes with 3 square faces at each vertex, Octahedrons with 4 equilateral triangle faces at each vertex, Dodecahedrons with 3 pentagons at each vertex and, Icosahedrons with 5 equilateral triangles meeting at each vertex. In Levin’s structure the shapes with triangular faces all share a common face plane, and the solids that have three shapes meeting at the vertices share common vertices. “Triboid” is a resin sculpture by Alfred Peris that is a ruled surface, which means that on any point of the surface there is a straight line that lies on the curved surface. 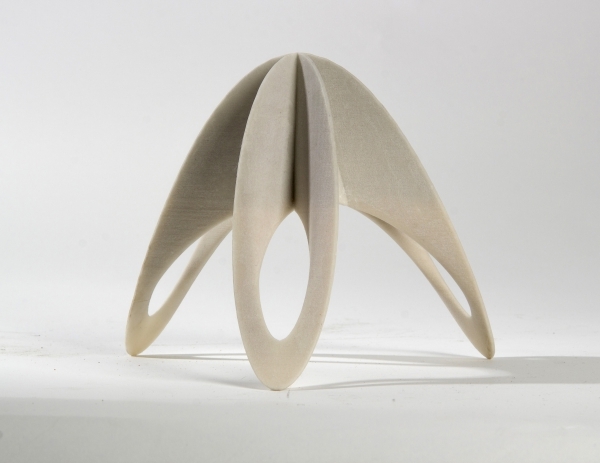 Peris generates these curved surfaces by taking a 2-D curve with no end points and then projects it into paraboloid of revolution to get a 3-D curve. The resulting sculpture has an elegant organic floral presence.